They are frequently used together. Is that a good idea though? No, not at all, and that’s what I’m going to convince you of in this blog post. But first lets talk little bit about what an ORM is, what it’s for, and what is lazy loading in the context of ORMs. ORM is an acronym for “Object Relational Mapper”. Two popular examples of ORMs are Entity Framework and Hibernate. In relational databases (like Sql Server, MySql, etc) the data is represented using tables, columns and rows. There is also the concept of a constraint like primary and foreign keys, indexes and many other things that have no direct equivalent in an object oriented programming language. Before ORMs were popular if you needed to read data from a database you would write a SQL query and that SQL code would live somewhere together with your source code. ORMs changed that by providing us with a way to declaratively specify how the data in a database maps to object oriented constructs. For example, how a table maps to a class and how a column maps to property. By having this intermediate layer it was now possible to write code that looks like it’s only manipulating objects, but that under the covers, is converted to SQL queries that are transparently sent to the database. This is great because it simplifies how we interact with data. Previously we’d have to write SQL statements, which effectively were strings in our code. Concatenating SQL with user input was very common, and that is basically what enables SQL injection. SQL injection happens when a user writes SQL statements instead of normal input in a textbox that end up being executed in your database. So that is roughly what an ORM is about. To really understand lazy loading we need to talk a little bit more about a concept in ORMs called Context (or Session). Whenever data is loaded and converted to objects in memory by an ORM and these objects are stored in a Context. After accessing the Customers property in the context and calling .ToList() on it (which is the operation that triggers the fetching of the data from the database), the customer data is stored in the context itself (for example in Entity Framework you would be able to access it in myContext.Customers.Local). This is so that if you make changes to a customer the ORM can figure out what changed and generate the appropriate SQL statements. Notice the virtual keyword in the Orders’ collection. It just means that you can create a subclass of customer and override what that property does. And that is precisely what the context will do if you enable lazy loading. With lazy loading enabled the context will keep track if that property was accessed or not. When it is accessed for the first time the context will transparently fetch the associated data (in this case the customer’s orders). This all looks very well. It is easy to read and understand, however it could be made more efficient. However, it is not obvious why unless you are familiar with how the particular ORM that you are using works. In this case this is Entity Framework where the data will be fetched on calling .Single(…) and when enumerating over the Orders. So in this example there are two database calls. This will trigger a database request when the the customers are enumerated (foreach over customers) and then for each customer’s orders. Hence the N+1, or 1+N if you prefer. In case you’re thinking this that lazy loading is terrible and never makes sense, in this situation you’re probably right. A situation that leads to a N+1 problem is likely always a mistake. However that doesn’t mean that lazy loading is never useful. Imagine a desktop application where the context is created and lives through several user interactions. For example the user opens a customer screen, looks at it and then decides to look at that customer’s orders. In this scenario lazy loading is very convenient and makes sense. When it does not is in a web application. That’s because the context will not exist during more than one user interaction. It’s just not possible. In a web application the user’s actions result in an HTTP request being sent from the user’s browser to the server. The server then does all the required processing for that request and sends a response back to the user. And then this process repeats for every user action. Between requests the server forgets about the user, so if a context is created in response to a user’s action it will be gone after the response is sent. That is just the stateless nature of the web. The only thing you can achieve using lazy loading in a web application is extra database calls you could avoid. That’s because if user asks for the orders of a particular customer, the code that runs in the server will have to load the customer and the orders all during the handling of the user’s request, it can either do it in a single database call or two. Lazy loading just makes it really easy to end up in the two database call scenario without realizing it. 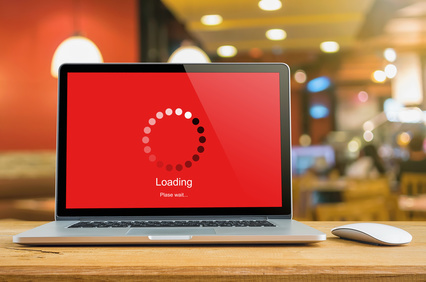 There’s nothing to be gained by using lazy loading in web applications, however it’s so much more common to see it being used in “the wild” than not. Even if we use the argument that it might be more convenient at times, the likelihood of having serious performance problems (like the N+1) offsets any possible benefits. Being able to have your users authenticate using Google, Facebook, Twitter, etc is a great way to remove the annoyance of having to create a local account and go through the email validation process. 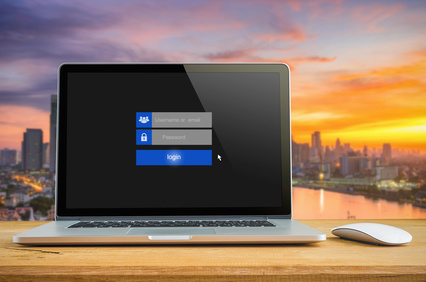 We usually refer to the services we delegate the task of authenticating our users as external login providers. The most popular protocols for this are OAuth2.0 and OpenId Connect. The documentation on using External Login providers in ASP.NET is scarce. To make matters worse the templates that you get when you do “File -> New Project” are not very easy to follow, and without the knowledge of how the authentication middleware in ASP.NET works, they are nearly impossible to comprehend. To really understand how to use external login providers with ASP.NET it is necessary to understand how the middleware pipeline and in particular the authentication middleware work, and also a little bit about the OAuth protocol. This blog post explains how all these pieces fit together and provides examples on how to leverage the authentication middleware for external login providers on their own and with ASP.NET Core Identity. When an ASP.NET Core application receives a request it goes through a pipeline composed of middleware “components”. Each middleware will have an opportunity to inspect the request, do something with it, pass it along the rest of the pipeline, and then do something extra with it after the rest of the pipeline has executed. One important thing to be aware of is that all the middleware will have access to an instance of HttpContext. It is through this instance that they can “send” messages to each other. For example, if a middleware at the end of the pipeline changes HttpContext by doing something like HttpContext.Items["LoginProvider"] = "Google", all the middleware that precedes it will be able to access that value. Another important thing to have in mind is that any middleware can stop the pipeline, i.e., it can just choose not to invoke the next middleware. This is particularly important for external login providers. For example, if you use Google as your external login provider the user will be redirected to http://YourAppDomain.com/signin-google after a successful authentication. If you’ve tried the default visual studio templates with external login providers, in this case Google, you might have noticed that there’s no controller action, or seemingly anything else that responds to that URL. What happens is that the GoogleAuthentication middleware looks for that URL, and when it finds it will “take over” the request by not invoking any other middleware down the pipeline, namely the MVC middleware. As a consequence of this type of behavior, the order in which the middlewares run is important. Imagine the scenario where you support multiple external login providers (e.g. Facebook and Google). When they run there needs to be a middleware before, namely the CookieAuthentication middleware, that is able to transform the information they put in HttpContext into a cookie that represents a signed in user (an example of this is given later in this article). What makes a middleware an authentication middleware is that it inherits from a class named AuthenticationMiddleware. That class does little more than create an AuthenticationHandler. It is in the AuthenticationHandler that most of the functionality is. Even though we’re not going to describe how you can create your own authentication middleware, we’re going to describe how the authentication middlewares can be interacted with, and also how they interact with each other, when you have several in the pipeline. When adding an AuthenticationMiddleware the minimum you have to specify is its AuthenticationScheme, a flag named AutomaticAuthenticate and another named AutomaticChallenge. You can think of the AuthenticationScheme as being the name of the authentication middleware. In previous versions of ASP.NET this was called authentication type. The AutomaticAuthenticate flag specifies that the middleware should “authenticate” the user as soon as it reaches its turn in the pipeline. For example, if the cookie middleware is added to the pipeline with AutomaticAuthenticate = true it will look for the authentication cookie in the request and use it to create a ClaimsPrincipal and add it to HttpContext. By the way, this is what makes a user be “logged in”. If you would setup a cookie middleware with AutomaticAuthenticate = false and there was a cookie in the request for that cookie middleware the user would not be automatically “logged in”. In previous versions of ASP.NET an authentication middleware with AutomaticAuthenticate = true was called an active authentication middleware, and with AutomaticAuthenticate = false was called passive authentication middleware. You can “challenge” an authentication middleware. This is a new term that did not exist prior to ASP.NET Core. I don’t know the reasoning behind calling it a challenge so I won’t try to describe why it’s called that way. Instead I’ll give you some examples of what happens when a middleware is “challenged”. For example, the cookie middleware when challenged will redirect the user to a login page. The Google authentication middleware returns a 302 response that redirects the user to Google’s OAuth sign in page. However, you can issue a “naked” challenge (i.e. not naming any authentication middleware, e.g. return Challenge()) and the authentication middleware that has AutomaticChallenge = true will be the one to respond to that challenge. A challenge is just one of the actions that can be “performed” on an authentication middleware. The others are Authenticate, SignIn and SignOut. 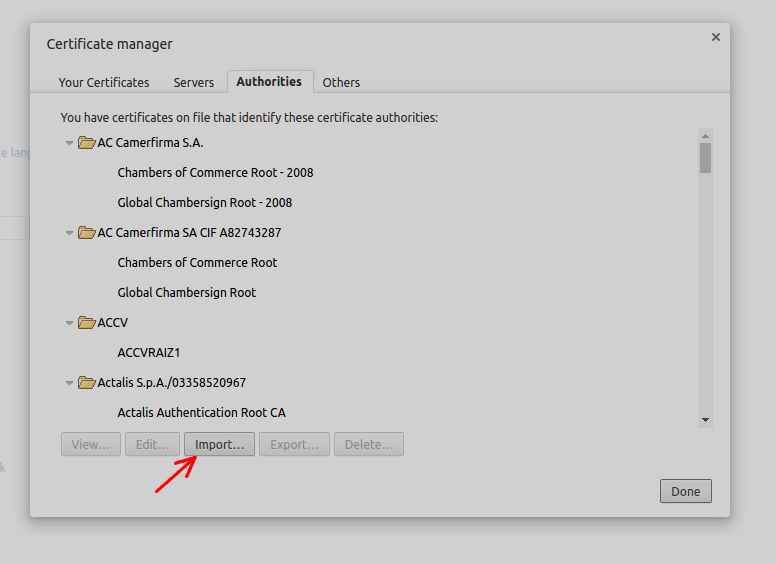 This will cause the middleware to try to authenticate and return a ClaimsPrincipal. For example, the cookie middleware will look at the request for a cookie and build a ClaimsPrincipal and ClaimsIdentity with the information contained in the cookie. Usually you’d issue a “manual” Authenticate in an authentication middleware that was configured with AutomaticAuthenticate = false. If “ApplicationCookie” were a cookie middleware it would modify the response so that a cookie would be created in the client. That cookie would contain all the information required to recreate the ClaimsPrincipal passed as a parameter. It is hard to imagine how all this fits together without an example, so here’s a simple example using the cookie authentication middleware. What happens when a request hits an ASP.NET Core application configured with this pipeline is that the cookie authentication middleware will inspect the request looking for a cookie. This is because the authentication middleware is configured with AutomaticAuthenticate = true. If the cookie is in the request, it is decrypted and converted into a ClaimsPrincipal and set in HttpContext.User. After this the cookie middleware will invoke the next middleware in the pipeline, in this case MVC. If the cookie is not in the request, the cookie middleware will just invoke the MVC middleware. A challenge is issued and since the cookie authentication middleware is configured with AutomaticChallenge = true it will handle it. The cookie middleware responds to a challenge by redirecting the user to the LoginPath (by creating a response with status code 302 and a Location header for /account/login). One important thing to be aware when manually issuing a challenge this way. If you issue a challenge for an authentication middleware (e.g. “MyCookie”) and that authentication middleware “signed the user in” (in this case there was an cookie in the request for that middleware), then the middleware will respond to the challenge as an unauthorized access and will redirect the user to /Account/AccessDenied. You can change that path by setting the AccessDeniedPath in CookieAuthenticationOptions. The reasoning behind this is that if the user is already signed in, and a challenge is issued to the middleware that signed the user in, it must mean that the user does not have sufficient permissions (e.g. does not have a required role). The behavior in previous versions of ASP.NET was to redirect the user back to the login page. However, this caused problems if external login providers were used. An external login provider “remembers” that you’ve already signed in. That’s why if you already signed in to, for example Facebook, and you use a web app that allows you to sign in with Facebook, you’ll be redirected to Facebook and then immediately back to the web app (assuming you’ve already authorized the web app in Facebook). If you don’t have enough permissions this can cause a redirect loop. So instead of a causing a redirect loop in these cases, the authentication middleware in ASP.NET Core will redirect the user to an access denied page. The simplest setup when relying on an external login provider is to configure a cookie authentication middleware that will be responsible for signing the user in, and then a middleware for the particular external login provider that we want to use. If no cookie is in the request, the cookie authentication middleware simply invokes the next middleware in the pipeline. In this case that will be the Google authentication middleware. We’ve “named” the Google authentication middleware in this example as “Google”. When we use an external login provider that provider must know about our web app. There’s always a step where you register your app and you are given an ID and a Secret (we’ll go into more detail about why these are needed later). That’s the ClientId and ClientSecret properties in the example. Next we’ve defined a CallbackPath. When a user successfully logins using an external login provider, the external login provider issues a redirect so that the user is sent back to the web application that originated the login process. The CallbackPath must match that the location to where the external login provider redirects the user to (this will become clear later on). Finally, the SignInScheme specifies to which authentication scheme the Google authentication middleware will issue a SignIn after a successful authentication. The only situations where the external login provider middleware will “intervene” is when it is “challenged” or when the request matches the CallbackPath. When you issue a challenge you can specify an instance of AuthenticationProperties. The AuthenticationProperties class allows you to specify, among other options, where the user should be redirect to in the event of a successful authentication. The user then has to login/authorize the web application and will then be redirected back to the web application. For example, if you were to define a redirect uri as http://www.yourdomain.com/signin-goole when you registered your web app with Google, then after a successful authentication with Google, that’s where your user will be redirected to. When that request comes, if the configuration is correct it will match the CallbackPath (/signin-google) and the GoogleAuthentication middleware will take over that request. The code value in the query string is then used to make a request to Google and get information about the user (this is part of the OAuth2 protocol and will be explained in more detail in the next section). Note that this is a request sent by the web application to Google. This is transparent to the user. With the response to that request (the one that uses the code) the GoogleAuthentication middleware creates a ClaimsPrincipal and “signs in” to the SignInScheme provided when configuring the middleware. Finally, the response is changed to a 302 redirect to the redirect url specified in the AuthenticationProperties in the Challenge (in this example that will be the Index aciton in the Home controller). If you’ve ever tried to use the default Visual Studio templates with external login providers you’ve probably noticed that if you authenticate using the external login provider you are taken to a page where you are asked to create a local user account. The user has to go through this intermediate step before effectively being logged in. This is achieved by using two cookie authentication middlewares. One that actively looks for a cookie in the request and signs the user in if it is present (AutomaticAuthenticate=true). This one is frequently called the ApplicationCookie, or in our example the MainCookie. And another one that is passive (AutomaticAuthenticate=false, i.e. it won’t automatically set HttpContext.User with the ClaimsIdentity user that is in the respective cookie). This one is frequently called the ExternalCookie because it’s the one to which the extrenal login providers will issue a “sign in”. The external login provider’s SignInScheme is set to the external cookie middleware (the one that is configured with AutomaticAuthenticate=false) and the challenge is issued with a RedirectUri set to a controller action that “manually” invokes an “Authentication” in that SignInScheme. The only difference between this and the previous scenario is that now there’s an additional authentication middleware (ExternalCookie) and the SignInScheme in the external login provider is set to that middleware. What we are doing in this controller action is “manually” triggering an Authenticate action in the ExternalCookie middleware. That is going to return a ClaimsPrincipal that is reconstructed from the cookie in the request. And that is what causes the ExternalCookie middleware to create the cookie. Next we can do some extra operations using the information contained in the ClaimsPrincipal, for example check if the user (through the email contained in ClaimsPrincipal.Claims) already has a local account, and if not redirect the user to a page where the option to create a local account is presented (this is what the default visual studio templates do). In this example we simply issue a SignIn action to the MainCookie middleware. This is will cause that cookie middleware to change the response sent to the user so that a cookie is created that encodes the ClaimsPrincipal (i.e. the response will have Set-Cookie header for a cookie named .AspNetCore.MainCookie with the encoded ClaimsPrincipal). Remember that this middleware is the one that has AutomaticAuthenticate=true and that means that on every request it will inspect it looking for a cookie (named .AspNetCore.MainCookie) and if it’s present, it will be decoded into a ClaimsPrincipal and set on HttpContext.User, effectively making the user be signed in. Finally we just issue a SignOut to the ExternalCookie middleware. This causes the middleware to remove its corresponding cookie. The Google authentication middleware will take over the request (CallBackPath matches /signin-google) and will use the one-time-use code to get information about the user. Finally it will issue a SignIn to ExternalCookie and issue a redirect to the RedirectUrl defined in step 1. In the controller action for the RedirectUrl a manual Authenticate is performed on the ExternalCookie. This provides a ClaimsPrincipal with the user information form Google. Finally a SignIn is issued to MainCookie with the ClaimsPrincipal (or a new one with additional information if required). A Sign out is issued to ExternalCookie so that its cookie gets deleted. In the examples above we’ve used a client Id, a client secret, a callback URL and we briefly mentioned that the response from Google contained a “code”, but we didn’t really motivated the need for all of this. These are all terms form the OAuth2 protocol, specifically from something that is called the “Authorization Code Workflow” (you can find a more comprehensive description of OAuth2 here). The first step when using OAuth is to register the client. The client in this case is your web application, and you have to register it so that the external login provider has information about it. That information is required so that when presenting the authorization form to your user it can display the name of your application, and so that it knows where to redirect your user after the user accepts or rejects your application’s “requirements”. In OAuth these “requirements” are known as the “scopes”. An example of two scope “items” for Google are “profile” and “email”. When your application redirects the user to Google and includes those scopes the user will be asked if it is ok that the web application is able to access profile and email information. In sum, when you register your application with an external login provider you’ll have to provide (at least) a name for your application and a callback url (e.g. www.mydomain.com/signin-google). What you get in return is a client id and a client secret. The client id and client secret is all you need to enable your web application to start using the external login provider. 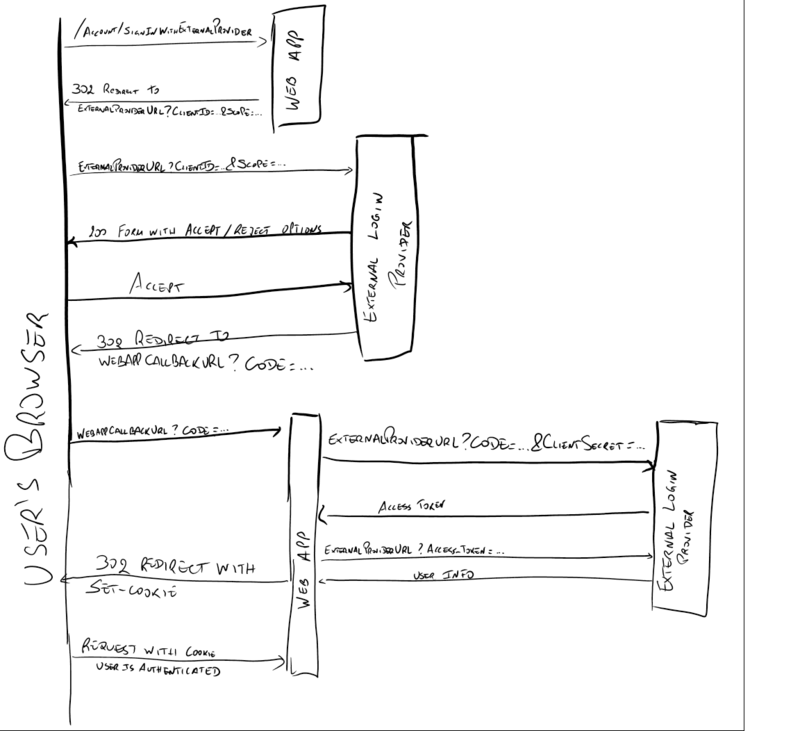 Here’s a diagram of the interactions between the user’s browser, your web application and the external login provider. I’m being very lax with the terminology here, the actual term should be authorization server, and the server that actually contains the user’s accounts is named resource server. They might be the same. You should read the digitial ocean article about OAuth if you need a more strict description of these terms. This is the authorization code grant. There are other workflows, but for a web application this is the one you’d use. Important things to note here is that the code can only be used one time and the client secret never goes to the user’s browser. This is so that it’s difficult for someone to impersonate your web application. They would need to know your client secret, and for that they’d need to have access to your server. This is a similar setup to the one we described earlier. The difference is that there are two new external authentication middlewares (TwoFactorRememberMeCookie and TwoFactorUserIdCookie which are out of the scope of this post) and the order between the “main” authentication middleware (the one that has AutomaticAuthenticate=true) and the one we use as to store the external login provider authentication result (ExternalCookie) are swapped (they will work the same way in either order). Also, the GoogleAuthentication middleware is configured with all the default options. The default for CallbackPath is new PathString("/signin-google"), and this is something that is specific for the particular external login provider middleware that you are using. The “item” with key “LoginProvider” is used later on. I’ll highlight it when appropriate. This is read from the AuthenticationProperties’s Items. When describing the challenge I mentioned that the Item with key “LoginProvider” was going to be used later on. This is where it is used. This will check if there’s a record in the AspNetUserLogins table. This table “links” an external login provider and a “provider key” (which is the user id for the external login provider) to a user in the AspNetUsers table (the primary key for this table is a composite key of LoginProvider and ProviderKey). So, if you sign in with Google, and your Google “user id” is 123123123123123123, and you’ve previously associated your local user (more on this shortly) to this external login, then ExternalLoginSignInAsync will issue a SignIn to the main cookie middleware and issue a SignOut to the external cookie middleware. The first time you do this though, there won’t be any local user or record on the AspNetUserLogins table, and the method will simply return SignInResult.Failed. In this page you are asked to confirm the email you want to use to create your local account (i.e. a record in the AspNetUsers table). This line will get the information that is stored in the external cookie and returns an instance of ExternalLoginInfo. This is exactly the same as what was done in the ExternalLoginCallback. This line creates a new instance of an ASP.NET Identity user using the email that was entered in the page where the user clicked Register. This line associates the newly created user with the external login provider we’ve just used. What this means is that a new record is created in the AspNetUserLogins. A record in this table has four columns, LoginProvider (info.LoginProvider, for example “Google”), ProviderKey (info.ProviderKey, for example 123123123123 which you can think as of Google’s user id for the user that just signed in), ProviderDisplayName which isn’t used (at least in this version of ASP.NET Identity as of 2017/04/29), and finally UserId which is the user id of the newly created user in the third line. Creates a ClaimsPrincipal for the user and issues a SignIn to the application cookie. This is the cookie that has AutomaticAuthenticate set to true which means that on the next request, that middleware will will set HttpContext.User with the user that was encoded in the cookie, effectivly making the user be “signed in”. Notice that the external cookie was never deleted in this flow. This isn’t a big problem since when the user eventually signs out, SignInManager.SignOutAsync is called and that internally issues a sign out to all authentication middlewares. And this concludes the description of how using a external login provider works in ASP.NET Core, both using only authentication middleware and using ASP.NET Core Identity. There’s more to using ASP.NET Core Identity with external login providers. You can associate several of them to a local user account. And it is also possible to remove them while being sure that you won’t shoot yourself on the foot, for example by removing all ways a user has to log in. But that can be a topic for another blog post. When learning about how to use OpenSSL to create self-signed certs, it became clear to me that most of the information available online assumes you know what certificates are, and how they fit in HTTPS. I decided to have a go at explaining HTTPS by explaining how communications are made secure, namely how Diffie-Hellman key exchange and digital certificates work. Here’s my take on it. HTTPS allows us to communicate securely over an insecure channel (for example over an open wifi network in an airport) where it is easy for someone to listen to all network traffic. The communications with HTTPS are secure because they are encrypted. The communication is encrypted using symmetric key encryption. This particular type of encryption requires that both the sender and receiver have the same key (i.e. the same key is used to encrypt and decrypt the data). But if the sender and the receiver need to send the key to each other through the insecure channel, doesn’t this make this whole exercise pointless? This can only work if the sender and receiver have a way of sending a secret key to each other even with someone listening to the communication (and without that someone being able to figure out what the secret key is). This is where the Diffie Hellman key exchange comes into play. Diffie-Hellman allows two parties to create a shared secret key without revealing it, while doing it “in the open”, i.e. even if someone has access to all the information that the two parties exchange, they sill won’t be able to discover what the secret key is. It sounds like magic, right? No, it’s just math. Here’s a simple example of how it works. First two numbers are picked, they are usually called p and g. p is short for prime, g is short for generator. A prime is a natural number greater than 1 that has no divisors other than 1 and itself. A generator g for prime number p is a number such that gx mod p for x between 1 and p-1 will “generate” all the numbers from 1 to p-1. mod (short for modulo) is a function that returns the remainder of an exact division, for example 5 mod 3 is 2, because the exact division of 5 by 3 is 1 and the remainder of that is 2 (3 * 1 + 2 = 5). If we order the results we get: 1, 2, 3, 4, 5, 6, we can see that they are all the numbers from 1 to p-1, which makes g = 3 a generator for p = 7. We know have all the pieces to perform Diffie-Hellman “by hand”. As an example, imagine Alice and Bob want to write letters to each other. Unfortunately someone is reading their correspondence, so they decide to use Diffie-Hellman to be able to communicate secretly. Alice picks g and p, for example g = 3, and p = 7 and sends a letter with them to Bob. Alice also picks a secret number less than p, for example 2. Once Bob receives p and g, he picks a secret number less than p, for example 5. Bob then computes this: gsecretBob mod p, in this case 35 mod 7 = 5. Bob sends this number to Alice, let’s call this number numberBobSent. At the same time Alice computes gsecretAlice mod p, in this case 32 mod 7 = 2 and sends it to Bob, let’s call this number numberAliceSent. Alice receives Bob’s letter with number 5. She then computes numberBobSentsecretAlice mod p, in this case 52 mod 7 = 4. Bob receives Alice’s letter and does the same: numberAliceSentsecretBob mod p, in this case 25 mod 7 = 4. Their shared secret is 4. Whoever read the letters could read p, g, numberAliceSent and numberBobSent. However, they don’t know neither Alice nor Bob’s secret numbers nor their shared secret. 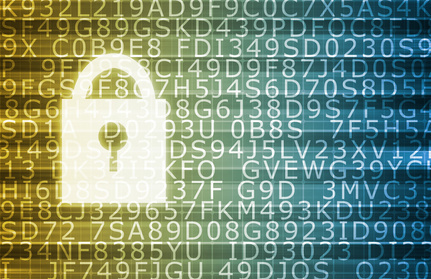 Alice and Bob can now use their shared secret to encrypt and decrypt their correspondence. This works because for large primes it is prohibitively costly to figure out the shared secret with the information that an eavesdropper has access to (p, g, and numberBobSent and numberAliceSent). We now know that web servers and browser clients can make use of Diffie-Hellman to establish a secret key to encrypt communications even when someone has access to all information that is exchanged. This solves the problem of secure communications over an insecure medium, right? Well, not really. Going back to Alice and Bob’s example, imagine that whoever is reading their correspondence, let’s say Eve, takes a more proactive role. Eve will grab Alice’s letters and replace them with her own, and will do the same with Bob’s. She will be able to establish a secret key with both Alice and Bob. Alice will think she’s corresponding with Bob, and Bob with Alice, while they are both corresponding with Eve. She then just has to receive Alice’s letters, decrypt them with the key she established with Alice, read them, encrypt them with the key she established with Bob and send them to him. There’s no way for Alice and Bob to know that their communication is not private. This is what is called “A man in the middle attack”. That’s where digital certificates come into play, but before we need to talk about asymmetric key encryption. With asymmetric keys, there are two keys, a private and a public one. Both can encrypt and decrypt, but if you encrypt with one of them you can only decrypt with the other. 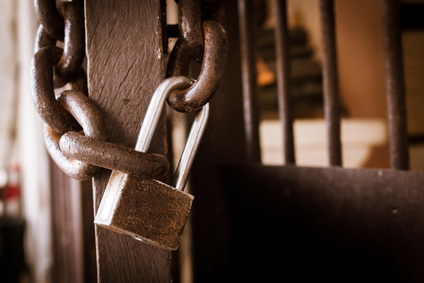 The private key is never supposed to be sent, while the public key can be freely sent to anyone. Because anything encrypted by the private key can only be decrypted with the public key, if someone sends you something encrypted and you can decrypt it with a public key, you know that only the holder of the private key could’ve encrypted what was sent. A certificate is just a public key bundled together with information about the holder of the private key (e.g. the subject name which usually contains the website domain, e.g. blinkingcaret.com). What makes a certificate trustworthy is that it is digitally signed by a certificate authority (an example would be Symantec or Letsencrypt). But first, what is a digital signature? 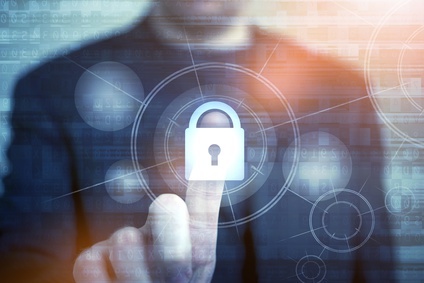 The goal of a digital signature is to prove the identity of the sender of the information and that the information was not changed along the way. A digital signature is performed in two steps. First a hash of what is to be signed is created (a hash function transforms an arbitrary amount of data into a fixed amount). Then it is encrypted using a private key. The encrypted hash is bundled together with the information. The encrypted hash is the signature. When someone receives a piece of information with the encrypted hash they can create a hash of the information themselves (using the same type of hashing function, e.g. md5), use the public key to decrypt the signature and compare the two hashes. If they match it means that the information not only was not changed, it was also created by whomever the private key belongs to. In case you are wondering why we don’t just encrypt all the information instead of using a hash function, that’s because the hash is much smaller and still has all the properties we need to guarantee that the information was not tampered with. 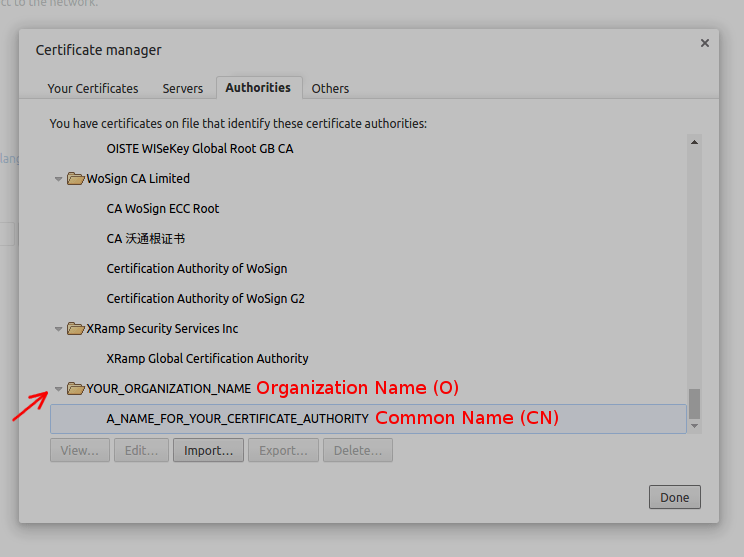 A certificate authority is an entity that signs certificates. To sign a certificate, a certificate authority needs a private key, and with that a public key, which also comes in a certificate. The certificate authorities’ certificates are special though. They are self-signed, which means they are signed with the private key that pairs with the public key in the certificate. Also, your computer’s operating system came installed with a several certificate authorities’ certificates. When someone gives us a certificate, if that certificate was signed by a certificate authority we trust (any of the certificate authorities for which we have a certificate installed in our computer) we trust the certificate (that’s when you get the green address bar your browser). So, coming back to Alice and Bob’s example, we should change the story here because the metaphor with the letters breaks a bit. Imagine that Bob and Alice would deliver the letters to each other by hand. Also, imagine that Alice and Bob had never met, they don’t know how the other one looks like. Although more complicated, a man in the middle attack is still possible in this scenario. Imagine someone, let’s say Joe would make himself pass by Bob and meet Alice, and then someone else, for example Jane, would pass herself by Alice and meet Bob. John and Jane could coordinate between themselves so that even if Alice and Bob tried to use Diffie-Hellman they would end up talking to Jane and John without knowing it. However, imagine now that Bob and Alice have id cards, issued by a government, and that are extremely difficult to forge. Alice can ask Bob for his id card. The card has Bob’s name and his picture, and is issued by a government that Alice knows is trustworthy, Alice is satisfied that Bob is whom he says he is. Bob can do the same in regards to Alice. 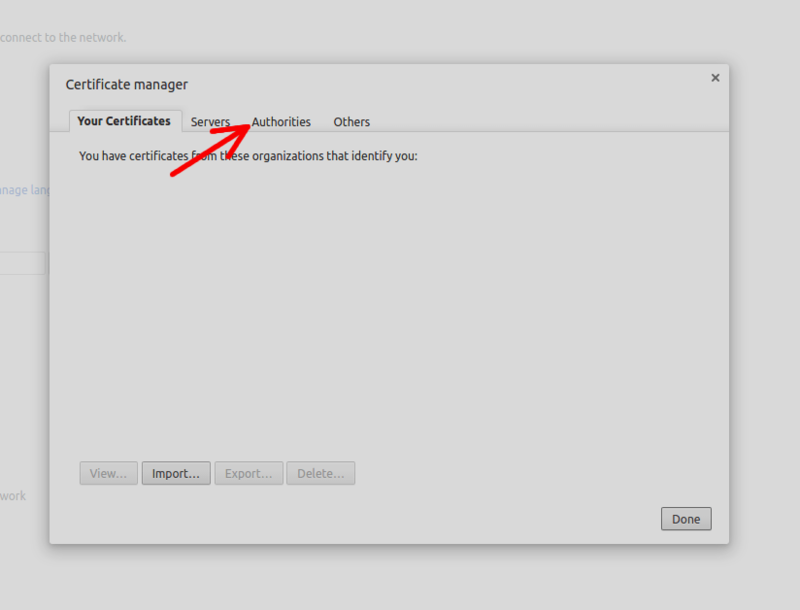 In HTTPS the id card is the certificate and the issuer is the certificate authority. Also, in HTTPS normally only the web server provides the certificate. However, although uncommon authentication of users with certificates is also possible. I hope this gives you a better idea of how all these pieces fit together to enable HTTPS. On my next post I’ll be describing how to create a certificate authority, install it, and create signed certificates using OpenSSL. To be sure you won’t miss it, follow me on twitter @ruidfigueiredo or click subscribe and I’ll let you know when the new post is online. Usually when you think HTML and CSS you don’t imagine desktop apps, but nowadays there are more and more examples of desktop apps being created using HTML and CSS. Visual Studio Code and Atom are just two examples (built using Electron). In this blog post I want to share with you how you can create a web page that looks and behaves (in terms of resizing) like a desktop app. The first challenge is to handle the window’s height in order to always have all of its contents visible without a vertical scroll bar. The first thing we can try is to add a div and set its height to 100%. Unfortunately this will not work. That’s because if you set an element’s height using a percentage, its actual height will be dictated by its parent element’s height. The default value for an element’s height is auto, which means its height will be the sum of the heights of its children. So, if you set a child element’s height to 100%, and the parent’s height is auto, you create a situation where both the child and parent elements needs each other’s heights to compute their own. What happens in this situation is that the percentage is ignored, and the child element’s height defaults to auto. Setting the height of the body to 100% will not work either. This is because although the body is seemingly the first element on a web page (you can omit the html tag and as long you have the body tag, you have a valid html document), it turns out that it’s the html element that is the root. If you set the html element’s height to 100% it will get the full height of the browser window. You can think of this as the browser window having a specific height that the html element will get if you set its height to 100%. You also have to set the body’s height to 100%. After that you have a container (the body) that takes up the full height of the window. You need to be aware that the body usually has a margin (8px if you are using Chrome). This will cause a scroll bar to be displayed. This happens because the default value for an element’s box-sizing property is content-box. 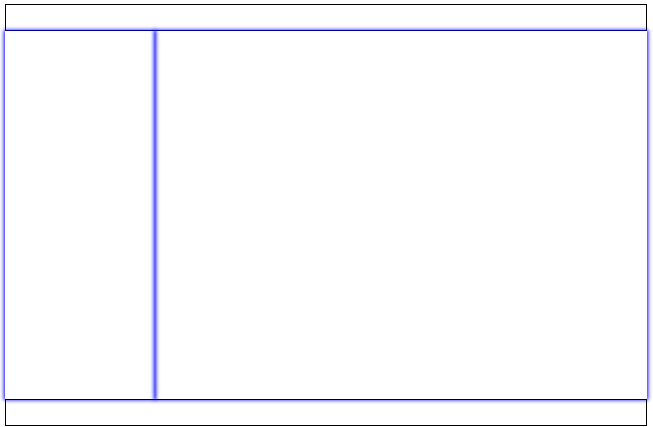 With box-sizing: content-box the “space” an element will take is the sum of its height, padding, margin and border. Because of this, the space the body will take is 100% of the window’s height plus 8 pixels, and that’s why you get a scroll bar. The next step is to create two fixed areas, one on top for the menu and one at the bottom for the status bar. The height of the area in between should stretch and shrink while the top and bottom remain fixed. The easiest way to achieve this behavior is to use Flexbox. The way you use Flexbox is by setting an element’s display property to flex. When you do this, the element is then called a “flex container”. Notice that this is different than using, for example, float: left. The items’ width is changing dynamically to match the available width of the container. The property that makes all items have equal width is flex: 1. In this case each element’s width is 1/3 of the container’s width. That’s because there are three elements with flex=1 so each gets 1/(1+1+1) of the container’s width. If the first element had flex: 2 and the other two had flex: 1, the first element’s width would be 2/(2+1+1) or 1/2, while the others would have 1/(2+1+1) or 1/4 of the container’s width. Effectively making the first element twice as wide as the other two. Another thing that is important to be aware is that the flex property is a shorthand property. When we set flex: 1 we are actually setting flex-grow: 1. The other two properties that the flex property allows you to set are flex-shrink (by how much the item shrinks in relation to the other flex items) and flex-basis (which represents the initial size of the flex item). To really understand how to use these values I recommend Dive into Flexbox and A Complete Guide to Flexbox, although they are not necessary for what we are trying to achieve here. Finally, the last important concept that we need to understand is flex-direction. Right now, our flex items are being laid out from left to right. That is because the default value for flex-direction is row. For our web page that looks like a desktop app we need them to be laid out from top to bottom, and for that we need to set the flex-direction of our flex container to column. We can apply all of what we’ve discussed above when flex-direction: column by just thinking about height as we did for width. Notice that now the container class has a height of 100% and both html and body have 100% height. If you set a fixed height in the flex container, the item’s height won’t be dynamic, because it’s container height is always the same. 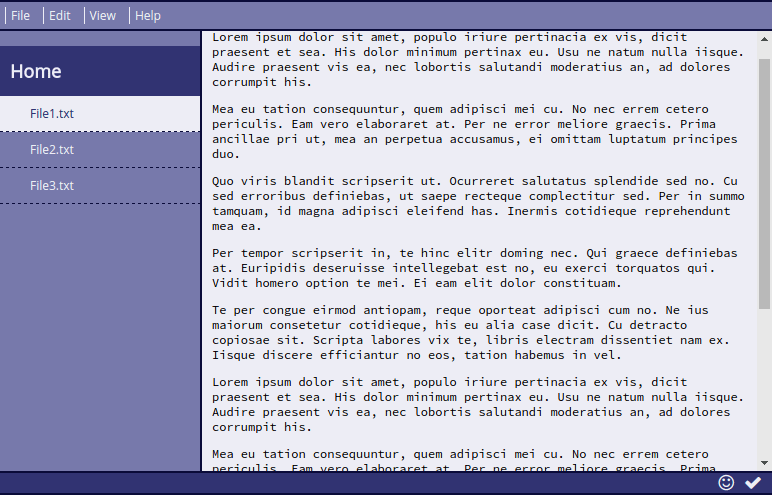 We now have all that is needed to understand our initial simple layout with a top menu, a main area and a status bar at the bottom. We are setting the body as a flex container with flex-direction as column, adding three flex items, two of them have fixed heights (the menu and the status bar) and the main area with flex set to 1. You are probably wondering why I’ve added min-height: 0 to “mainArea”. It turns out that in Firefox a flex item’s minimum size is based on their children’s intrinsic size. An element’s intrinsic size is the size they would have if they hadn’t overflow: auto. We’re adding a child to this flex item later on that we are expecting to overflow. That means that the min-size of “mainArea”, which defaults to min-size: auto in Firefox, can potentially be bigger than the total available height. Setting min-height to 0 solves this. See this stack overflow question for more information or you can try reading the flexbox’s spec for min-size. Note that this is the behavior described in the spec, so it is likely that it will come to the other browsers as well. What we need now is a sidebar on the left and a content area on the right. And they should be inside what we’ve called our main area (div with id=”mainArea”). To do this we’ll set the div with id=”mainArea” as a flex container with a flex-direction of row (the default, so if want you can even omit this property). We are going to add two new flex items inside this new flex container. The first will have a fixed width and won’t expand or contract with its container, so it’s flex property will be none. It will be our sidebar. We want the second item to stretch and shrink so that it takes all of the available space, so we are setting its flex property to 1. Also, because this will be the item that contains the contents of our “web page that looks like an app”, and that content might take more space than what’s available in the window, we’ll set its overflow property to auto so that the scroll bar is displayed automatically (remember the min-size:0 in the mainArea, this is the reason for it). Let’s call the first item sidebar and make it a div, and the second content and make it a div. If you made it this far, here’s a nice thing to try: Go to Electron’s quick start page and follow the instructions to get the sample running. After that, replace the index.html that comes with the sample with the one you’ve created following the instructions from this blog post (don’t forget to add the css file with the styles) and run the sample. There you go, you’ve just created the skeleton of your first Electron app that runs on Windows, OSX and Linux.